The new FdA in Photography has been written with feedback from previous students in mind, and the programme intends to offer a broad-based photography curriculum, giving students the option to explore a number of different genres in photography – from street/documentary and fine art photography to industrial/advertising photography. The Programme Leader has been responsible for co-designing and delivering degree level photography at the Institute since we began offering degrees within what was then East Coast Media in 2003. Together, the course team have almost thirty years experience in teaching photography in both Higher Education and Further Education contexts. 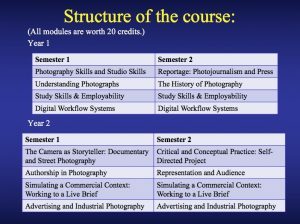 Postgraduate study at other universities (eg, MAs in Documentary Photography or Fine Art Photography). Work towards acquiring teaching qualifications (PGCEs, for example) and seeking employment in education. Publish work in the form of books, etc. Work with leading photographers as assistants. Work as photojournalists for newspapers. Establish their own businesses as commercial photographers. We have impressive facilities, including a photographic studio and a darkroom, and an enthusiastic and experienced team. Staff are experienced both in teaching and also specific areas of photographic practice. Our class sizes are usually between 10 and 20 students, offering a more personal and tailored experience than is often offered at larger institutions. We also offer this website as a forum for the publication of student work and in 2017-18 are developing a print publication (book) which will be available commercially and in which samples of the work of our students will be available – offering our students the opportunity of becoming published photographers before they graduate.